Race for the Solar System is inspired by a long time favorite of mine: Race for the Galaxy. My wife and I played hundreds of games, while dating and in the first year of our marriage. We still come back to it occasionally. This is quasi-express version (smaller, but not necessarily quicker). It is a no luck euro that encourages optimization of actions using a cube management system. Players are racing to colonize planets, develop them, and expand their resources and abilities. Whomever manages their actions and resources the best, while taking advantage of the actions their opponents take will claim victory by having the most points at the end of the game. 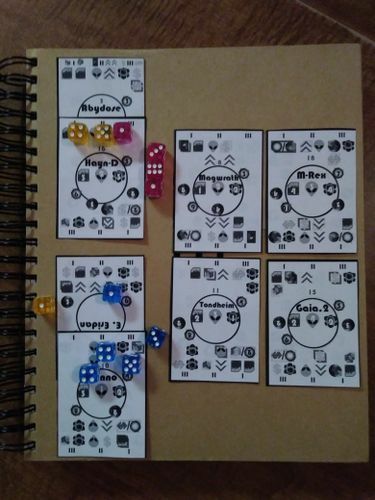 Rules + Card Print + Low ink + Low ink with phase divisions. 1. Double-sided cards for maximum replayability. 2. Variant/Advanced mode: the addition of an auction for start planets to help naturally balance what is likely impossible to perfectly balance. 3. Other things you may suggest: other special power ideas, etc. 1. This is the second submission for this contest. The previous one "UP" was about designing a game around a theme I love and have not seen much of: rock climbing. This game is about designing a game that I will want to continue to come back to. 2. I'm open to ALL feedback. Feel free to talk trash to my game. It can take it. I'm MOST interested in feedback around gameplay and balance. Graphics I consider secondary unless they are not functional, but am still happy to hear as I have a lot of growing to do in this area. 3. Thanks for taking a look! 1. A couple minor tweaks to symbols based on feedback from some playtests with friends. 2. An updated rulebook with some minor tweaks to wording and clarity. 3. A MAJOR addition of a Gameplay Walkthrough as an alternate way to learn the main rules of the game. 5. Synthesizing the lower and lowest ink cards into one for the new double-sided cards. 7. Advanced Auction Rules for starting planets once players are familiar with the game (since it is impossible to perfectly balance the planets). 8. Low ink version with phase divisions added. Also made starting planets have white text on this low ink version for consistency with rules. 9. Adjusted the balance of planets by making the secondary sides have maximum 2 spots for developments. This should allow the secondary sides to see more play as it is more valuable and easier to get them to the secondary side. For now this is only on the low ink with phase divisions cards. Some playtesters may be put off by the amount of ink required to print this one out. So I recommend creating a low ink version - at the very least without the black background. You weren't supposed to find this yet! For the purposes of playtesting I would simplify the planet to a black outline. Anyone who enjoys the game enough can print out the full colour version once it's contest ready. My partner and I really enjoy Race for the Galaxy too. I'm keen to try this version. Do you mean "If one player chose to resolve a phase and other players did not..."
Thanks for the catch. Essentially, the same as RftG. I'll update that clarification later tonight if I get a chance. SOLO players: I've noticed a vast difference in ability of the AI depending on starting planet. Boreal is the hardest and most in line with what I have intended. My intention is to create dualsided cards and have a specific side for AI start planets. BUT wanting to make sure I've not missed any major issues prior to implementing dualsided cards. Welcome again to the contest! Rules have seen some minor tweaks. For anyone who has taken a look, I have assumed that the rules and Iconography are fairly big hindrances to getting this to the table. Thanks to anyone following. I have been really enjoying tweaking this one and will be very interested in any feedback, but at the moment I'm primarily interested in the solo mode experience if anyone gives it a go. I think Multiplayer is self-balancing once players add in the Advanced Auction rules. Hey Chris, I'll be playing this in the next few days. In the meantime, I'll wait for the new cards and rules and give them a look. ALL 7 updates below completed!! The rules seem clear and I feel like I have good grasp of the rules from reading through. Hopefully this feeling will continue when I play the game! The iconography in the game and the graphic design could use some more clarification, as there's so much packed in there with no visual clue to the separation between phases. I think just putting a little outline around the icons for each phase would help group them and help with "icon overload"
The other minor thing I noticed was that there didn't seem to be any consistency with where the upgrade/development icons go. I would prefer them to be consistently to the the right or underneath the basic icon. I would also consider removing the tiny icons if they always apply to the actions. Could they go on the back of the rulebook as a reference card of sorts? These are good suggestions. I'm a bit of GIMP noob, but I agree that the white text would be useful on start planets in the low ink version. I'll see if I can figure that one out. I like how the lines help with differentiating phase bonuses and also help with "iconography overload" as you aptly phrased it. I'm not too sure what you mean about consistency with the upgrade/development icons. In the card above the bottom right development in phase II is a major development (red square border) that once developed allows for a minor development action in phase II. Normally developments happen in phase I. Is that what you are getting at? And most of all thanks for taking a look!!! It was just a very minor thing where the placement of icons within each phase seems a bit random. It's easier for me to understand which are default icons and which require development if they're always placed in a similar grouping/order within each phase section. Low Ink Cards now have phase divisions. This is a separate file (2 low ink versions). The full art cards have not been updated yet as I'm not sure if I'm going to keep this or not for the finale. But for now should help new players with understanding and to prevent iconography overload! Thanks to Alex Cannon for this suggestion! As usual, I used my One Deck Dungeon dice as cubes, and it worked great with three colors of dice: 5 blue for my “cubes,” 4 pink for the AI’s “cubes” (I played easy mode), and 3 yellows for the “dice” (1 for me to track loans, 2 to roll the AI’s actions). I’ve played Race for the Galaxy once and enjoyed it, so I’m generally familiar with the concept. Unfortunately, I read the rules for RftSS without reading the walkthrough, and I was very confused. In my misunderstanding of the rules, I won...barely (28 to 28, with one more wealth cube). After reading the walkthrough I was still confused on some things, but I trounced the AI at 25 to 20. I want to say that I liked this game as a solo experience, but I can only say I enjoyed half of it. I found the options and progress of turns to be fun, developing resources and optimizing my cards and shopping for planets. But playing solo against the AI made me feel like I had to rush, which I didn't like. In solo games I like to take my time. The game is called a race, true, but I felt in the original like I got plenty of time to build up (“This is New Sparta!”), whereas in this game I felt like I was just trying to buy as many planets as possible as quickly as possible. In the original, there were multiple ways to win, but in this game, especially solo, every planet you don't colonize is one that the AI will...which will make it better able to colonize higher-value planets with their inexhaustible purchasing power...there's just no other way to win. I just had to match the AI planet for planet, every chance I could. What I would like to see for this game, if it can fit it, is a variety of viable strategies. More like the original, with its trade and military and all the other stuff I don't remember. That way, the AI may use one strategy, but the player has a choice of effective strategies, and perhaps the one the AI is using isn't ideal in its particular situation. One way to do this: on each of the starting planets, include a special advantage and a special disadvantage that will apply for all the player’s planets. For example, a planet with an extra VP for recolonizing vs. -2 Initiative when doing the colonize planet action. For another example, a planet that lets a development action remove 2 yellow cubes vs. ignoring all colonize bonuses. This may be too complex, and maybe you've already built strategic variety in that I’ve missed, but I found myself really wishing it was there. At least for the solo experience, where the AI had no debt and defaulted to colonize new planets, ending the game in very few turns. But enough of that. Here are some smaller-scale comments. 1. “...Players move cubes from their poverty area to the wealth area equal to the number of $ icons showing in the third column.” So you don't get to remove one automatically just for completing the action? If you don't have a $ symbol in the third column, then you can't earn back anything from phase III? 3. If a player chooses two actions, then can bonuses newly gotten in the first action be used in the next action? 4. Bonuses could use more description. If bonuses like income are listed beneath a phase’s Roman numerals, do those bonuses apply only on the rounds you choose that phase? Or are they applied only during the phase whose Roman numeral they're below (even if another player is the one who choose that phase)? 5. When colonizing in my first playthrough, I wasn't sure how to determine initiative order. Was it the highest-numbered or lowest-numbered planet that went first? Or the highest/lowest total initiative of all planets? When did the initiative bonuses apply? (It turned out the bonuses were the initiative.) Did each of the initiative bonuses count for 1 extra initiative (or maybe one less)? The rules would sometimes say things about highest initiative, and sometimes about lowest, but it never actually defined initiative order. On my second play, the walkthrough made it look like I counted up pairs of arrows to determine initiative order; if so (which is how I played my second play), then one of them is wrong. (Step 11: “...while Player B had no initiative.” He has one set of arrows on Betazoa, under Phase II.) In all, initiative could be described with a lot more clarity. 6. Until I read the walkthrough, I had no clue that bonuses with a rectangular box got covered with two cubes. I fact, I had recorded it as a question to ask about, but the walkthrough answered it. 1. “Colonizing moon ties go to the moon with the most moons, then bottommost.” (a) The moon with the most moons? (b) Bottommost? The walkthrough has a vertical arrangement with starting planet on top, but I didn't see this in the rules at all. If references are made to “bottommost,” then there should probably be a rule about how colonized planets are organized. 2. There was a time when the AI had enough cubes to colonize a planet, but it wouldn’t have 2 cubes left over at the end of the round for 2 actions. I went ahead with it anyway, but I didn't remember a rule about needing 2 cubes left over at the end of every round. Loans can’t help if all cubes are being used on planet bonuses, and the AI can't do loans anyway. Add it in, or did I miss it somewhere? 3. As I said earlier, the AI seemed frustrating to me because of how quickly it tried to end the game. It seemed like since it didn't have debt or poverty to worry about, it always had extra dice to spend on planets, and colonizing planets was nearly always the highest-point option. 1. The planet names I found to be very interesting and helped to immerse me in the experience! What does the E in E. Eridan stand for? Hayn-D? Bellemonde must be a beautiful planet! It would be cool to have a description of each of the planets in the rules! 2. The alien head for Biologics I found to be a bit off-putting. The green men are supposed to be the ones doing the breeding, not the other way around! Breeding sentient life seems eh. Perhaps a more universal, less specific icon, such as a DNA strand, might do the trick? 3. I think it would really help to have the walkthrough incorporated into the rulebook. It seems like both are necessary, and the visual reference is a lot of help. 4. Once I became familiar with the icons, I was really impressed by the variety that they brought to each of the cards! It’s a great shorthand that allows lots of options. I’m sorry I didn't enjoy this game more, but all the same, I found a lot to appreciate in it. I’m glad you found a way to take a game that's important to you and make it a little more accessible to everyone. Thanks for sharing your ideas! That's amazing that the game fit on a notepad! Clever. Thank you Thank you Thank you for giving this a try. I NEEDED some outside feedback. 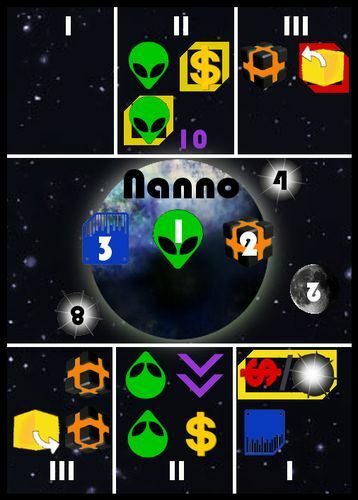 This has to be in the top 3 for most complicated nanogame in the contest. From your comments below and the picture above I can tell that you got the gist of the game, but that I need to clear up many things in the rules to better help players. I've already made rules enhancements based upon your feedback, but to spare you rereading the rules I'll address each of your questions/comments separately. Also the solo game should be set-up like a 2 player game, so you should have 6 cubes and 1 die. You'll also be pleased to learn that in your picture the way you played means that you were actually not playing on easy mode since you used the 2 dice to roll for actions as cubes (I think I've not clarified not to do this in the rules). I've adjusted the difficulty levels slightly too. I've been dissatisfied with this aspect as well, but came to embrace it. Thank you for raising this. I've now changed it so that the AI rerolls a die for phase II to determine which type of colonize action it takes and tried to take each one if it can't take the one it rolled. I think this should make it so some games the AI rushes and others it slows down. Less predictability in how it will act, but overall it'll mean there is a bit more time. I've yet to see if this is an improvement. Before I tried to change the priority order and the AI got "stuck" more easily. I think this will work. What I would like to see for this game, if it can fit it, is a variety of viable strategies. I don't think I have time to drastically alter the game as is though I like your suggestion. I thought I had built in variety, though I honestly couldn't come up with any more "actions" or bonuses. That being said I do like the planet specific VP bonus/negative. I tried to build that in with the VP bonus on the secondary side. Of course if you were racing to colonize planets in solo then it would be very hard to unlock these. I found that as well. Hopefully the change to solo will open this up a bit more. Originally this was true, but I changed it and missed the change in the rules revision. Now every player gets an income for the phase at minumum plus the phase bonus allows for repaying loan or income. Yes. Clarified in the rules now. I've tried to clarify this, but maybe I need an example in the rules. You get to trigger all bonuses on all planet that fall under the phase that is triggered. This is the only one I'll ask you to take a look at in the rules as I've added some symbols and clarity that won't fully work here. I'm contemplating changing the minor development and major development icon to a yellow and red cube respectively. Would that help? I've added this. Essentially add new planets above and slide underneath top card. As above the dice are not used as cubes, so all of their cubes can be used. Do you think I still need to mention that the AI doesn't need to keep cubes around? I like your idea. Not sure that I'll have time to implement it, but prefer it for sure. While I was initially pretty bummed by reading your post, once I gave myself a bit of time I came back to it and really appreciate all your effort and hard-work. I also appreciate your honesty in not liking the game. It sounds like it was primarily because the AI rushed you through, not allowing you to experience a more diverse play. I hope my changes will help other players experience it more fully if playing solo. Thank you again for playing this. I know how much of a time commitment reading rules and play testing and writing up results is. I can't thank you enough! Wow, thanks for a great response! No worries, I was happy to give this game a try! I have been considering buying Race for the Galaxy or Roll for the Galaxy, and a lite solo-friendly version sounded right up my alley. And yes, I did enjoy the mechanisms and process of play, it was the pace of the game and lack of front-end variety that I struggled with. Oh, that explains a lot! Does that mean I was playing on Normal Mode with one die too few? I'll have to look through the walkthrough again...Perhaps I didn't have to struggle so hard! I've now changed it so that the AI rerolls a die for phase II to determine which type of colonize action it takes and tried to take each one if it can't take the one it rolled. I think this should make it so some games the AI rushes and others it slows down. Less predictability in how it will act, but overall it'll mean there is a bit more time. I've yet to see if this is an improvement. Before I tried to change the priority order and the AI got "stuck" more easily. I think this will work. I like that idea! It should certainly be an improvement, because the AI will be less predictable and gameplay may last long enough to get those rectangle box advantages in there. I'm wondering about the chance-based nature of the change though, whether it will be too random to plan around. I'll playtest the new rules in the next few days and let you know how it works for me. Yeah, I agree that it's a bit late now to make big changes, and you did already build a lot of variety into the game. A lot of that variety is gated off on the secondary side, though. So would a small change be too much, using current material to give a starting bonus? What if you just put one extra normal, unblocked bonus in the middle of each starting planet that could be acted on once per round in any phase? (Like an extra minor development or colonize moon.) That would considerably vary player strategy by starting planet with minimal change. Yes!! That would be so much clearer in my opinion! No I haven't yet played that game, but I watched a review once and it looked fascinating! Is it the realm of the space lions? Sorry, I had been keeping records of concerns and questions about the game, and by the time I finished with them I didn't realize I had only skimmed over what I enjoyed about it! I think that the "icon collection" idea is really cool, because it provides a unique character to each planet and allows the player to build build up extra resources, actions, and end score bonuses much like the original game's deck-building mechanism. Combined with the upgrade options and endgame rewards for each planet, I felt like there were no wrong choices (except perhaps colonizing a 3 VP planet after the third round ), only good and better choices. I like the process of shopping for planets, growing them to their full potential, and watching the bonuses roll in! Playing Gloomhaven has introduced me to the art of board game AI, and I enjoyed the tension here of dice-rolled actions and action optimization. There is a lot to like about this game solo, it's just getting to that content and using it for more than "how quickly can I buy the next planet" that I think will make this a fully enjoyable experience for me. I'll let you know if the updated rules contribute to open up that experience. So would a small change be too much, using current material to give a starting bonus? What if you just put one extra normal, unblocked bonus in the middle of each starting planet that could be acted on once per round in any phase? (Like an extra minor development or colonize moon.) That would considerably vary player strategy by starting planet with minimal change. I like this idea. It would be tricky to balance, but I'm debating this one. I also wonder about lessening the amount of cubes that get locked in on the secondary side, maybe just leave the rectangles, so you are getting more bang for flipping while keeping access to more cubes. And now I'm wondering what happens if the AI can't afford the action(s) it rolls. Do unusable actions, say a recolonize when all cubes are on planets, just get ignored? If the AI can't afford to do any colonization action nothing happens. There is a priority order and I have not stated overtly, but if it can't do anything it won't. With the new dice for colonize, it cycles through the actions: if it rolls a 4 or 5 it tries to recolonize (rotate), if it can't it'll try to colonize moon, then it'll try to colonize a new planet. I've only played twice and I don't recall if it is connected to another universe or is its own. I think its got a universe unto itself though. The races I recall being pretty cool. I'm not a sci-fi buff though I enjoy many sci-fi games. Thanks again for giving this a go. I think it needs more work to get to a balanced place where recolonzing is actually contemplated vs new planets. Otherwise it'll just be a race for the new ones in the centre. Again I appreciate your feedback! I've updated the low print with phase divisions cards. I lessened the amount of "future plans" (development cubes) that you are committing to recolonize (rotate the card to the secondary side). This makes recolonizing more valuable, so players will be less likely to race just for new planets. The secondary side is now all about capitalizing on points and its likely a player who takes 5 planets and colonizes no new planets would lose to a player who takes 3 planets and recolonizes all of them. My fear in doing this is that the solo mode is going to suffer a bit as the AI is likely to make more "mistakes". Let the testing begin! If anyone has already printed an earlier version of the cards, feel free to trial that version as it will still provide a similar experience. I'm just playing with balance to allow multiple paths to be open. And to open up the secondary sides more. I'll be finalizing changes to make this Contest Ready by April 11th at the latest as I am going on some holidays April 12th. I played RftSS again with the updated phase division cards and rules, and I had a great time! I read through the rules, and they were much clearer than before. Determining initiative, the meaning of the initiative symbol (2 stacked chevrons = 1 initiative), the use of the die and the solo mode AI's action dice, how to choose two of the same action, and the sequence of activating bonuses seemed clear and easy to understand. The slight increase in dice the AI used made sense to me and seemed right. The changes to the AI's colonize action were clearly written, but the default colonize tiebreaker "leftmost" seemed to assume only one row of planets would be present. I tended to play with two rows. Was there a rule about this that I missed? As a result, my playthrough was much easier and less confusing: I felt like I generally knew what to do and only had to consult the rulebook rarely. The phase divisions on the cards also helped me to keep track of what bonuses applied at each phase, which caused me considerable trouble before. Like before (but correctly and consciously this time), I played on Normal Mode (6 cubes for each of us, 1 die/cube for me). With the changes to the cards and AI, the game felt much less frantic, even though I probably played the same number of turns, because I got to recolonize my planets and I felt like doing so was rewarding. I found myself looking carefully at my possible acquisitions, the developments that were most significant, and the potential merits of each planet; the diversity I saw was impressive and combined very well with the AI's behavior, often flummoxing but sometimes helping it. I was particularly impressed with how you themed Precyon to both feature and reward colonizing moons. I gunned for that planet as soon as I could. In the final rounds of the game, I chose the strategy of colonizing my many, many moons. 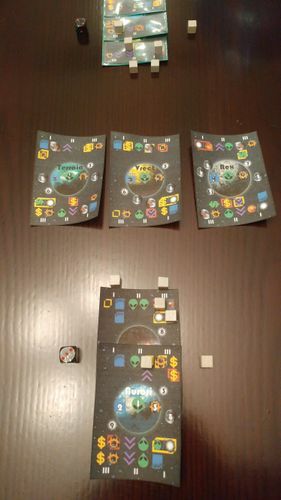 Since I owned Precyon, my total moon count on my three cards was five, so colonizing them earned me ten extra points from the planet's special bonus. Unfortunately, colonizing so many moons meant I had only one die left and was unable to perform any more actions. This also meant that I was at the mercy of the AI to take the final planet. But it had developed so few times, it still had a lot of cubes on its planets, and when after two turns it finally had enough cubes to take the planet...it rolled to recolonize instead. That ate up the cubes I had hoped would be used to colonize the planet! I wasted over five useless turns moving my single unmooned die to the colonize action, waiting for the AI to finally develop enough to colonize once more...and in the process it recolonized another planet and a 4-point moon and uncovered a bonus that earned it 3 extra points. With three cards versus the AI's five, I still felt confident I had won: all my planets were recolonized, I had a couple of good bonuses, and as previously mentioned, I had colonized five moons to the AI's one. Subtracting 1 VP for the loan you can't get rid of (it can't go lower than 1, right? ), I ended with 45 VP. But because of all the extra recolonizing and development the AI did while I was helplessly waiting for it to finish, it ended with 47 points. I was so close!! If I had just colonized that last planet instead of leaving it to the AI with its ridiculous initiative, I probably would have won that game. Still, it was a very close finish. The gameplay felt much more strategic, varied, and meaningful. The AI's colonize roll usually resulted in a colonize action for one reason or another, but the uncertainty really helped open up the game in combination with the revised cards. However, that sticking point at the end went on a bit long, and I was helpless to do anything because I had fewer than 3 cubes free--but you can say that itself was a strategic misstep on my part. For whatever reason, I found the pacing a bit slow, and I was happy about that for most of the game until the end. To sum up, my experience of this version of the game was vastly superior to the last.